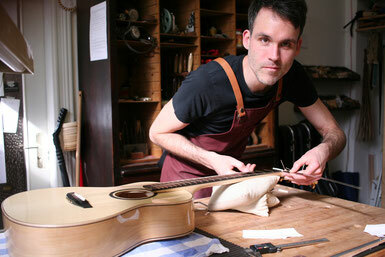 After training as a luthier, Jakob Poljakoff opened his workshop in Berlin in 2011. 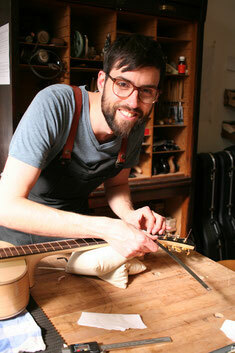 He has learned the wonderful craft at the International School of Guitarmaking at Newark Sherwood College in England. There, he was taught the art of instrument making under the direction of James Lister, Adrian Lucas and Malacy Brady and completed his time in college with a diploma with honors. Since a few years now, his brother Alexander is working on Jacob's side. Like Jakob, he brings with him a great deal of professional modeling know-how and skills, which he learned during his more than ten years as a modeler in automotive design for well-known manufacturers in Germany and abroad. The aesthetic understanding of forms and surfaces, as well as the sensitive handling of different materials, have defined his own high quality standards. Together Jakob and Alexander lead the workshop through the next years and are happy to develop "Poljakoff guitars" with new ideas not only soundwise.